We offer classroom based German language programs to children 4 – 17 years or the end of High School. The 2017/18 academic year rings in our first “Vorschul-Klasse” for the 4 – 6 year old. Our ‘Vorschul-Klasse’ program for our youngest learners is taught by Frau Livia a gifted educator, who has a BA in Education and a Masters Certification in the Dalcroze-Method for Music & Movement from the Conservatory in Stuttgart. Livia has been teaching young children in Germany and Orange County for the past 27 years. She currently teaches Orff Music classes and also German Language Circles at a school in Laguna Beach. At German School Campus she’ll use her experience with the Dalcroze-Method and teach our 4-6 year olds the German language through songs and rhythm. Children will learn numbers, the days of the week, the calendar, seasons and much more through fun songs and plays. As it is tradition in our school, also our youngest members will learn how to introduce themselves and hold up a small and simple conversation by the end of the year. You’ll be surprised by their success! Our engaging teaching method benefits all Kindergarten Kids. While we focus more on the spoken word with our youngest ones in the class we introduce simple writing and reading in German to our 5-6 year old’s. Working on art projects and doing crafts further enhances the German language immersion. Throughout the year all classes at German School campus participate in celebrating German traditions and prepare for the festivities in an age-appropriate way. Highlights are our much loved lantern parade in November. ( St.Martin), Saint Nicholas (December 6th) and the fun Gingerbread house decorating contest in December as well as a Family Christmas celebration that presents a play and Christmas caroling by our students. In February we have our Karneval Party. In March the Easter Egg Hunt. First week in July is a one week Immersion Science STEM Summer Camp. Each level of German studies will culminate in the corresponding German Exam A1, A2, B1 through B2/C1 of the Common European Framework of Reference for Language (CEFRL) and AATG Level 1 to 4. Our teachers are on task as they visit conferences during the year and keep going with continuing education. Except less order instructions or assistance the classes remain in the German language. A1 Our “Beginner class” and younger students (7-9) learn through games, songs, poems, proverbs, days of the week, counting ,vocabulary of family members, friends, meals, daily routine. Early Grammatik starts right from the beginning. We will work in small groups to challenge early reading. Memory training strengthens through rhythm and game. A2 Our “Intermediate students” (10-13) add on the vocabularies, fairy tales of the Brothers Grimm and poems, going shopping, describe where they live, how the home looks like. They learn about directions, cities in Germany and inventions. They will write letters and invitations, talk about vacation . They will learn to talk about their plans in the future and dream jobs. We work in small groups to challenge reading. Applied Geography starts and students learn much more about Germany and the German speaking countries in Europe Grammatik goes throughout the course adding the present tense and modal verb and cases in the German language. We add on Science, Technology, Engineering , Math ( STEM) in special Saturday sessions. We will work on projects like the Environment. B1 ”Deutsches Sprachdiplom I” Our Advanced students (14 +) dive into Media and Communications. They learn about intellectual abilities , speak about foreign exchange, the world of tomorrow and future plans. They express their dreams and emotions. They can argues and talk about solving problems. Austria and Switzerland with part of history and applied geography will be in the curriculum. Grammatik is up to past tense and past perfect and Future I. We will work in small groups to read literature. We add on Science, Technology, Engineering , Math ( STEM) in special Saturday sessions. We will work on projects like Computer Technology. AP “Advance Placement Prep class German language” Our high Advanced students ( 15+) will get guidance and support and vocabulary training in classes as they work towards this exam. We work through 8 chapters and follow the AP exam guidelines. Each chapter includes texts on a variety of topics, all of which are connected to the six official themes of AP German Language and Culture. This class is exam training AP for German Language and Culture and is an intensive course. B2/C1 “Deutsches Sprachdiplom II” Our high Advanced students ( 16+) will work towards the final German Language exam for High School students. They get guidance and support as we work through each of the 12 chapters. Movies, Vocabulary training , online and Apps help to be 7 days on task toward the exam studies. Each language course A1 to B2/C1 and AP is supported by one of the newest books and work books and Grammatik trainers from the German publishers. 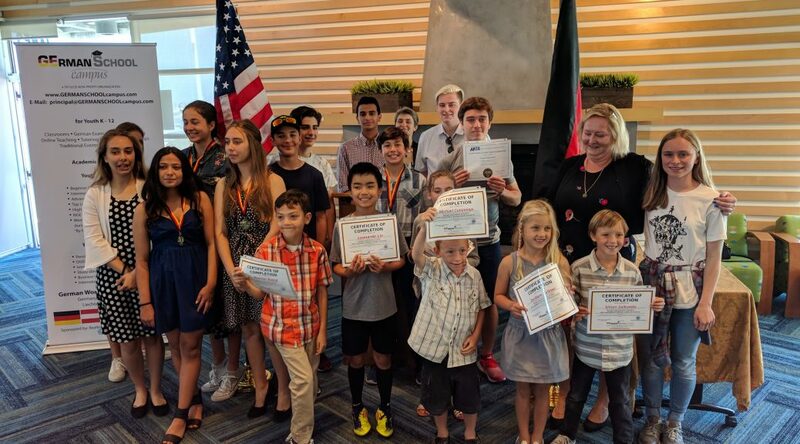 The German School campus Newport Beach is a Language school open to all students who desire to master the German Language or to enhance their German language skills.